Located along the hills of the Vindyas and Aravalli ranges, Ranthambore, lies near the town of Sawai Madhopur in Rajasthan. 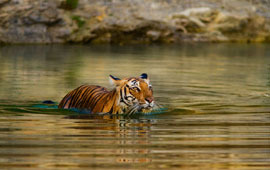 Ranthambore is a place of historical importance as well as an internationally famous Wildlife reserve. Ranthambore Fort, part of the World Heritage Site Hill Forts of Rajasthan, lies within the Ranthambore National Park which was once the hunting ground for the Maharajas of Jaipur, before India gained independence. The fort overlooks the Ranthambore National Park and offers some of the most breathtaking views of the Park. The Ranthambore National Park, spread over an area of 392 sq kms, with a network of lakes and rivers, is home to Tigers, Leopards, Jungle Cats, Hyenas, Fox, Jackal, Marsh Crocodiles, besides Chital, Nilgai and Chinkara. Sambhar Deers are considered to be pride of Ranthambore. The park, which can be visited in mornings and evenings in 4W driven vehicles, has more than 300 varieties of avian population including Black Storks, Quails, Crested Serpent Eagles and Painted Storks.